Anna died of typhoid fever at the age of 21. 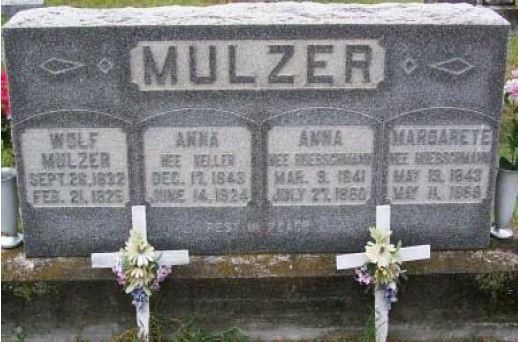 According to her obit in the local paper, she was survived by six brothers, six sisters, and her parents, Wolfgang Mulzer and Anna Keller. She never married. This entry was posted in Spencer County and tagged Keller, Mulzer on July 14, 2014 by oahblog. Wolfgang and his mother, Margaretha Barbara and her husband George S. Voit, along with several others immigrated to North America in 1851. They traveled to Bremen, Germany where they boarded a ship bound for New Orleans, Louisiana, landing in November of 1851. They made their way up the Mississippi to the Ohio River and disembarked at Troy, Perry Co., Indiana. They took up farming in Spencer County. Wolfgang had befriended the Johann Hubschman family. Johann and Margaret E. Polster had given Wolfgang their permission to marry their eldest daughter, Anna, before their deaths in 1855 and 1856. With that permission, Wolfgang had promised to take care of the Hubschman children. Wolfgang then took into his home the five younger children. Anna was very ill from consumption and died at the age of 19, the day after her and Wolf’s only son’s first birthday. On September 30, 1862 Wolfgang married Margatha Huebschman (his first wife’s younger sister). She was also ill of consumption and died, but not before giving Wolfgang two daughters. In 1870 Wolfgang married Anna Keller. Anna came to America with her father and mother, George Keller and Barbara Kuffner, arriving in New Orleans. Anna and Wolfgang were blessed with eleven children. Wolfgang attended school until he was 14 years old, and was considered to be highly educated. He was part of the core group of St. John Evangelical Lutheran Church in Evanston, Spencer County, Indiana. All of his children were baptized there. He was an Elder in the church and when the pastor was gone, he would read the sermons. On September 1, 1856 Wolfgang became a citizen of the United States at Rockport, Spencer County, Indiana. 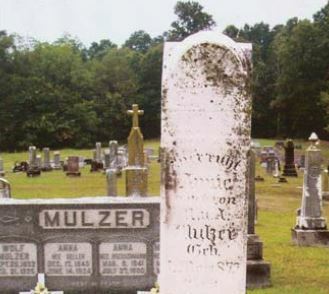 Johann Mulzer, Wolfgang’s first son was born in Spencer County, Indiana. He married Louisa Wilhelmina Maier in 1884. Five children were born to this union. After Louisa’s death, Johann married Anna Mary Lottes Dersch at Trinity United Church of Christ near Fulda, Indiana. To this union, two children were born. Johann and his wives were very hard-working farmers in Spencer County. This entry was posted in Spencer County and tagged Bauer, Braun, Huebschman, Keiper, Keller, Kiefner, Lottes, Mulzer, Peters, Polster, Schultz, Vogel, Wittman on July 9, 2014 by oahblog. George was born in Spencer County, IN and was never married. George went to bed one night in good health and was found dead in bed the next morning. He was working in Louisville at his uncle’s fish market at the time of his death. The doctor attributed his sudden death to apoplexy. This entry was posted in Spencer County and tagged Keller, Mulzer on July 9, 2014 by oahblog. Johann was born in Huff Township of Spencer County, Indiana. He took his family and moved to Winslow, Dodge County, Nebraska, in 1916. 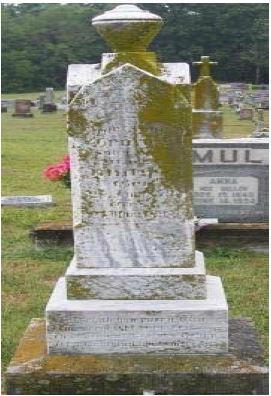 He and Clara were married at St. John’s Lutheran Church in Evanston, Indiana, and are buried next to each other in the Memorial Cemetery in Fremont, Nebraska. This entry was posted in Spencer County and tagged Dunklau, Fisher, Jensen, Katt, Keller, Mulzer, Peck, Pressley, Purtzer, Wittman on July 8, 2014 by oahblog. Jacob moved about 1884 to Cherokee County, Kansas. This entry was posted in Uncategorized and tagged Keller, Myers on March 24, 2014 by oahblog. Henry emigrated from Indiana to Columbus, Cherokee County, Kansas, about 1884. This entry was posted in Uncategorized and tagged Keller, Meyers on March 24, 2014 by oahblog.